Gregory earned a Political Science degree from Oregon State University and a law degree from Lewis and Clark Law School. 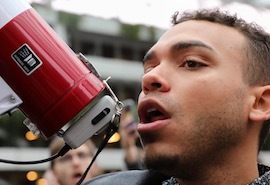 In Portland, Gregory is easily recognized as the face and voice of Portland Resistance. This 23-year-old spokesman has been a key figure in local street activism since 2014. In the fall of 2016, he appeared regularly in the media as the organizer of the resistance protests downtown. His message is delivered as part protest and part community activism, with a healthy dose of street theatre mixed in as well with the goal of changing the nature of civil rights activism. Gregory’s message is focused and sophisticated. Many of the issues he has tackled have become community talking points. He helped raise awareness of issues related to Portland’s policing, brought attention to questions related to the City’s contract with the police union, and advocates with Portland Tenants United. At the 2016 Democratic National Convention, he was a representative for Bernie Sanders.